At the recent National Association of State Election Directors and National Association of Secretaries of State Annual Conferences a lot — but not all — of the discussion focused on cybersecurity and the protection our elections. Many ideas and best practices were shared but there was one idea that had people getting out of their seats to take a closer look and even snap a few photos. What was all the fuss? A poster. A project launched by the Department of Homeland Security in conjunction with states that on the surface seems so simple, but that ultimately provides critical information at no cost to states and counties. The posters are divided into three sections, safeguards, threats/risks and the checklist. 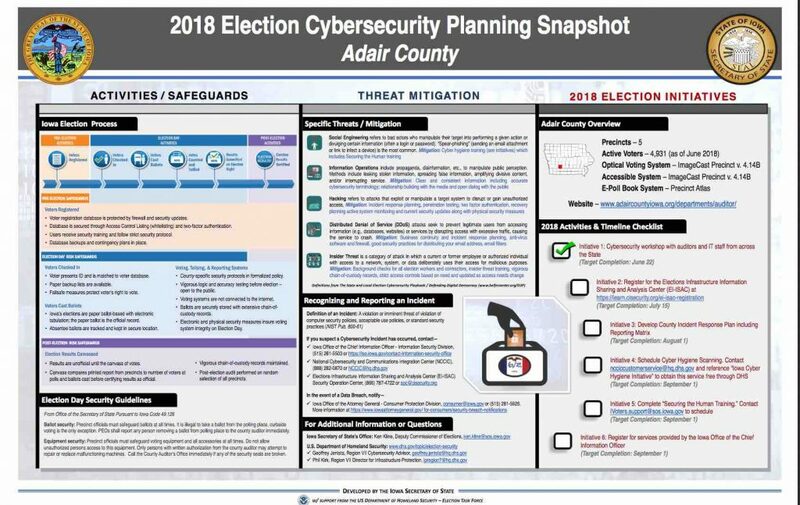 Geoff Hale, cybersecurity strategy and integration program manager, who spearheaded the project for DHS said the poster is totally customizable to the states/counties and while DHS encourages them to include some information about certain safeguards (phishing), nothing is required. The first state DHS worked with was Iowa. Dawn Williams, director of elections for the State of Iowa, had already been thinking about her own poster project, one that she could have all the counties post in their employee area as a reminder of the everyday importance of strong cybersecurity practices. When Masterson was in Iowa to speak about cybersecurity, Williams had a chance to talk to him about her poster idea and he told her about DHS’ poster. It was the perfect launching point. After working closely with Williams in Iowa to get the posters just right, in the early days of the project, DHS also worked with Ohio, Rhode Island and Washington so they could scale the posters for any type of voting climate — vote-by-mail, elections run by towns and municipalities instead of counties, etc. Since the NASED and NASS conferences Masterson said they have heard from quite a few states about implementing the poster project there. DHS is working with a contractor to produce the posters and Masterson said they are prepared to scale pretty significantly based on demand. It takes about 2-3 weeks to turn the project around depending on state-specific needs. While the poster project starts with the states, Masterson said DHS would love to hear from counties that are interested so he and Hale can then work with the county reach out to that state and get them onboard. Masterson and Hale don’t anticipate this project just being for 2018 so that’s why they would encourage states to reach out to them at any time. The anticipation is that even states who have already received posters will need new/updated ones as threats change and evolve. And while it may seem simple on the surface, Masterson noted that the importance of this poster project reaches to the highest levels at DHS. 2 Comments on "Posterize This! Newest electionlineWeekly Looks at DHS Effort in Iowa"